INSTANT REFRESH. ON-THE-GO FILTER EFFECT. 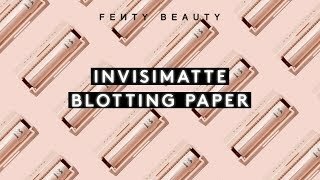 Invisimatte’s translucent blot powder is completely traceless against all skin tones and won’t cake, clog pores, creep into fine lines, or disturb makeup. And get this: It extends the wear of your foundation, too. Invismatte Blotting Powder's sleek, magnetized compact attaches to its perfect partner, the Portable Touch Up Brush, meaning that it’s easy to keep your shine-stopping essentials within reach. So touch up, touch up again, and bring on the photo ops—when we say translucent, we mean it. 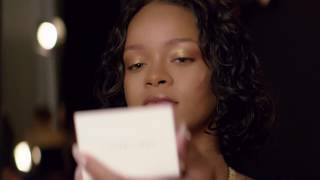 Rihanna believes that being photoready means being shine-free. INVISIMATTE is rated 4.8 out of 5 by 94. Rated 5 out of 5 by Deanne from Perfect! My new obsession! Hey guys! I bought this product not to long ago and I am OBSESSED with it! I have naturally oily skin, even if I wash my face, moisturize, and take good care of my skin, my skin is just naturally oily. It’s just the way my skin is and o have tried a lot of blotting products in my day. I’ve tried setting powders, blotting powders, self setting makeup and everything but my natural oils always find a way to seep through. I tried this and I fell in love. Not only did I use this to actually “set” my under eyes but I also used this on my tzone and whole face and I was matte all day! Even after a whole day of running errands and sweating and just being busy this kept my face oil free and matte looking! Definitely recommend to anyone who has an oily complexion or would just like to look less shiny. Rated 5 out of 5 by lucia from keeps makeup in place all day I use it every time I wear foundation and it works amazingly. My skin always looks smooth without being oily. Even after having sweated or been in a warm environment, the foundation and concealer will be locked in place. Rated 5 out of 5 by Keely DFW from Essential for oily skin! I bought this to see if it would help to mattify my oily T-Zone and I am so happy with it. I applied before my foundation and it helped my makeup look freshly applicated by the end of the work day! Definitely recommend for oily skin. Rated 5 out of 5 by Ari24 from Absolutely amazing!!! 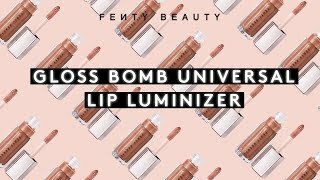 I can’t believe I’ve ever thought my makeup was completely without this product! Weightless, matte finish, portable. I could go on forever! I am in loveeeeeeee! Rated 5 out of 5 by Brenny from Amazing I love this so much, the best setting powder ever!!. Highly recommended!. Rated 5 out of 5 by James Huynh from Mattifies The Skin Very Well I really love this product so much! It makes the unwanted shine on my face literally disappear with just a swipe with a brush. It is compact and very easy to bring with you and the magnet brush is very convient. I would like to mention that the powder looks white, but it really is translucent. Overall, this is my favorite setting powder so far! Would recommend.